Michael, could you elaborate on " it takes roughly 40 months for spending to rise to meet an outperforming portfolio" and " it takes roughly 20 months for spending to drop to reflect an underperforming portfolio"? @AnatoliN: Sure. To begin with, if stocks and the HISA give returns that exactly match expectations (inflation+3% and inflation+0%), then the calculations are designed so that monthly spending will exactly match inflation. Suppose that stocks make a sudden drop that is large enough to make the portfolio (including the HISA) drop 10%. After the drop suppose that all returns exactly match expectations. 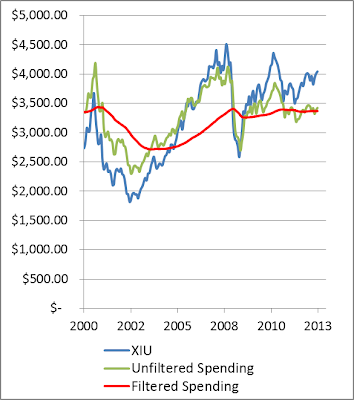 Without the filtering, monthly spending would suddenly drop 10% and then match inflation. With the filtering, it will take a while for spending to drop by 10%. Spending will actually follow something close to an exponential decay. It will take about 20 months for spending to drop by two-thirds of the expected 10% drop. If the portfolio had jumped up by 10% and then met expectations thereafter, it would take about 40 months for spending to rise by two-thirds of the expected 10% increase. In reality, there are never long periods where returns exactly match expectations, so monthly spending is always adjusting up and down based on portfolio volatility. The filtering is present to smooth out this volatility. Great article Michael. Really enjoyed it. What you have created is a financial form of one of the most basic pieces of electronic circuitry. It's called a low pass filter. Basically, any signal (like the price of XIU), contains many signals with many different frequencies blended together. The result looks like an incoherent mess. 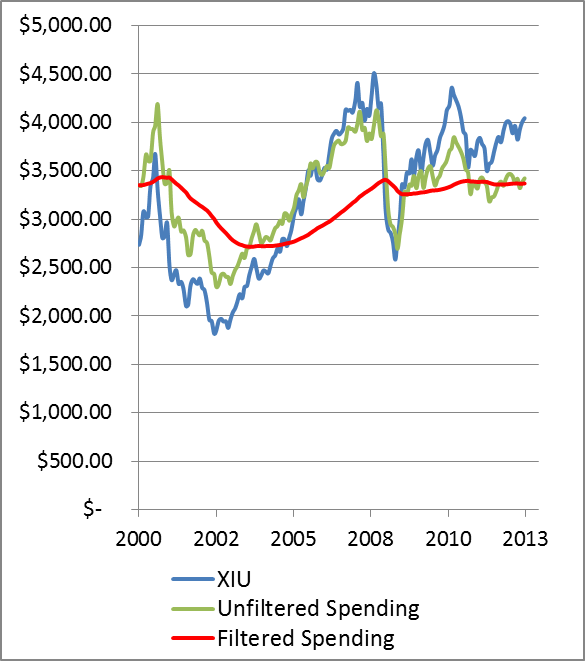 What you have done by creating the "filtering" rules is to remove the high frequency signals which cause XIU (and monthly spending) to jump around. This has the effect of smoothing the output. You adjust the "smoothness" by modifying the parameters of the filter. If you changed the 40 and 20 parameters to say 80 and 40, respectively, the ride would get smoother still, however the risk changes. These filter "parameters" allow for personalization of the financial plan. It's a really cool application basic electrical engineering concepts. Great article! Looking forward to any further posts on it. @Nathan: Glad you liked it. I have a degree in Electrical Engineering, so coming up with the filter idea wasn't a stretch for me :-) I thought about calling it something simpler sounding than a filter, but didn't come up with any better names. I think the next steps are to try these ideas out on other time periods for stocks and to mix in different types of investment accounts (RRSP, TFSA, taxable). I'm not in too much of a hurry, though. I'll wait for some good ideas. Nice post. Since you are looking for feedback, a likely consequence of your approach will be increases in income throughout a 35 year retirement period. In addition to the retirement goals you mention above, for me I would add the goal to have spend more earlier in retirement if possible. For example, I may not be able to travel when I'm closer to 95. If that was your goal too (don't know), how would you modify your approach? @Blitxer68: Thanks for the feedback. I assume your reasoning is that stocks are likely to return more than inflation+3%. If this turns out to be the case, you're right that income will rise with time. I agree that this is undesirable. I need to find the right balance between an undesirable rise in income (meaning that income was too low early on) and the risk of income dropping too low. Perhaps the best thing to do would be some experiments on historical data to see what happens when we vary the stock return assumption over different time periods. I'll have to think about this some more. Perhaps your return assumptions are conservative. I was thinking more that the approach is slower to adapt to higher versus lower expected returns, which I think will likely lead to an increasing retirement income stream. More food for thought. What would be the plan if a market drop happened just before retirement? If it's okay for income to drop after retirement, does it follow that it would it be okay to retire anyway on time? If the plan would be to delay retirement, then there may be a flaw here. @Blitzer68: My engineering sense tells me that the asymmetry of the filter would make little difference over the long term, but I should probably test this with some simulations. My plan is to delay retirement until I feel I can safely sell off enough assets to fill the HISA to get this whole income strategy started. If I decide I want to set a specific retirement date, then I'll need to start filling up the HISA 5 years before that date. You're right that it would be a flaw to commit to a retirement date with 100% of assets in stocks and then risk a big market drop without first filling the HISA. I think your plan makes sense. I would put a few more spending years in the HISA, but I think this would just let me sleep better at night and would not be a rational preference. More importantly than this is probably the initial withdrawal rate of $3,400/month, or around 4% of assets. You might want to see what impact a lower withdrawal rate has in the long term. You also might want to look at running your plan through market returns starting in 1966 or so, where there was a long period of low real returns until 1982 or so when returns started to pick up again. Finally there's the tricky business of the exit strategy from your pre to post retirement asset allocation. You might want to think about making the transition when your have enough to cover the basics (e.g. food shelter, clothing). Otherwise, if the market drops before your make the transition (when you could have met basic needs), you may have regrets. The regrets may continue if the market is down for awhile. @Iwonder: Thanks for the feedback. Here are my thoughts. The initial withdrawal rate is driven by the assumptions about real return on stocks and the HISA as well as the other parameters such as life expectancy. It makes sense to try simulations that vary these parameters (which will change the initial withdrawal rate) as well as varying the time period as you suggest. The only change I'm suggesting for pre- and post-retirement asset allocation is filling the HISA and possibly buying an annuity. Filling the HISA is pretty straightforward when a specific retirement date is known at least 5 years in advance -- you'd just start selling off stocks every 3 or 6 months to start filling the HISA. For those who choose a variable retirement date driven by when savings are high enough, it would make sense to fill the HISA quickly when stocks aren't at multi-year lows. Great post. If only more people (and more advisors) understood these facts... If your advisor has CSI's Advanced Retirement Strategies certificate then they'll have a good understanding of the issues your identified.